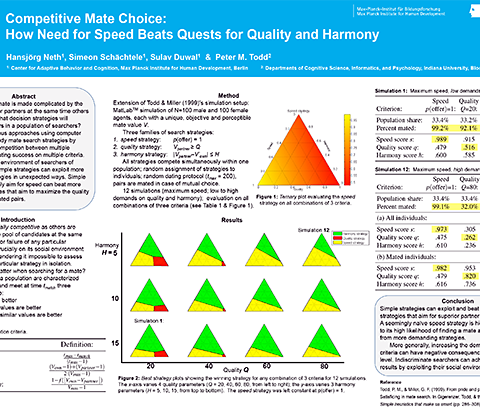 Keywords: Mate choice, sequential search, simple heuristics, strategy competition, agent-based modeling, social simulation. Reference: Neth, H., Schächtele, S., Duwal, S., & Todd, P. M. (2011). 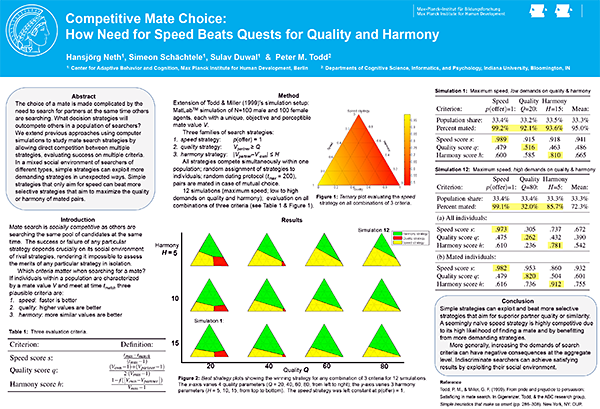 Competitive mate choice: How need for speed beats quests for quality and harmony. In L. Carlson, C. Hölscher, & T. Shipley (Eds. ), Proceedings of the 33rd annual conference of the Cognitive Science Society (pp. 699–704). Austin, TX: Cognitive Science Society.